Do you seek a more natural look for your outdoor space? Are of tired of staring at paved surfaces? Then you need to call Abbey Turf today as we are the best bark chips supplier Southampton has seen. With many years’ of experience, we can meet your needs with a product that is of the finest quality. Whether you are looking to spruce up your garden or renovate a school playground, it’s important that you select the right materials. At Abbey Turf, we are proud of our status as a leading Southampton bark chips supplier. With bark chips supplied per cubic metre, we can tailor the amount to suit projects of all shapes and sizes. 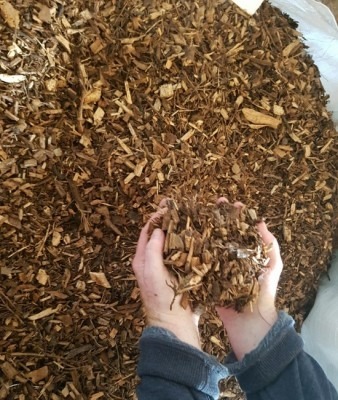 Find out below what we can do for you as a reputable bark chips supplier in Southampton. How can Abbey Turf help? When you contact the most respectable bark chips supplier Southampton has to offer, you will receive a professional service that is bespoke to you. Our team will sit with you to discuss your needs, and we can cater to both domestic and commercial clients to provide bark chips for a wide variety of purposes. If you are unsure about anything, simply leave it to the most helpful bark chips supplier Southampton has encountered. Once we have a better understanding of your needs, we will pack your bark chips into one of our strong maxi bags. We can then arrange to deliver this to your property or site at a time of your choosing. For added convenience, we will specify the exact date and time, so you won’t end up wasting your day waiting around. If you need help lifting the bags over a fence, our bark chips supplier in Southampton has you covered. What are the benefits using bark chips in place of traditional materials? At Abbey Turf, our Southampton bark chips supplier can provide products to suit all requirements. From filling plant pots to creating borders, bark chips will form a mulch that will provide excellent water retention. Plus, our products will also provide protection from frost damage and sun scorching while helping to enrich and aerate the soil. This will help to stimulate growth leading to healthier plants. Bark chips are also a fantastic alternative to traditional surfacing materials such as tarmac and asphalt. They provide for much softer impact absorption making them ideally suited for use in playgrounds. Also, their natural textured look and feel will help create an effect that blends more harmoniously with the surrounding area. For more information, take a look at our information page now and choose us as your professional bark chips supplier in Southampton. What makes us the finest bark chips supplier Southampton has experienced? When you are looking for a Southampton bark chips supplier, it pays to hire a company who are committed to protecting the environment. At Abbey Turf, we source all of our bark chips from sustainable resources using methods that are non-destructive. Our bark chips supplier in Southampton inspect all products on a daily basis to make certain that they meet our high standards. As a company with more than 25 years’ of experience, we have a great deal of experience in supplying high-quality turf, topsoil, and bark chips to clients across Southampton. From golf clubs and local authorities to schools and even the government, we are chosen by many clients to be their official bark chips supplier in Southampton. Get in contact with Abbey Turf now on 02380 812302 and discover for yourself what makes us the most trusted bark chips supplier Southampton has seen.